Large or small, we can build a Cinefold to meet your projection needs. Single-frame construction is available for standard and custom sizes through 10 1/2' 14'. Extra-rigid truss-style frame is required for larger custom orders; smaller truss-style screens are recommended for heavy use. Truss-style frames and legs are constructed of parallel sections of I' square anodized aluminum tubing, arc welded to form a 6" wide truss. Truss-style Cinefolds fold exactly like single-frame screens, with the addition of a special frame stiffener at every horizontal hinge. Assembly is quick and easy with Handy Cranks. All truss-style Cinefolds are furnished with special 6" wide black borders to completely conceal truss frame. DressUp Kits are available for all custom screens as well as for standard sizes. 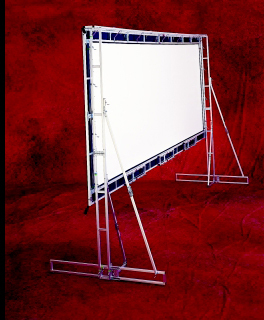 A truss-style Cinefold is built to order and shipped complete with truss frame and legs, snap-on surface with protective soft case, heavy-duty leg stabilizers, frame stiffeners and heavy-duty thermoplastic carrying case. Truss Cinefolds can be made to almost any custom size. 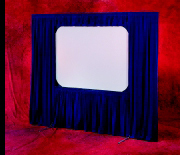 For a memorable presentation, give your Cinefold a professional, cinema-like appearance with a velour DressUp Kit. Rich blue or black stage curtains surround the viewing surface, focus attention on the screen, and frame your visual presentation. Inquire about custom colors. All Cinefold DressUp fabrics are flame proofed to meet fire safety codes. DressUp Kits are especially worthwhile for rear screen presentations. The velour curtains conceal the projection equipment, shield the audience from projector light and help exclude light from the projection area. Screen size and aspect ratio may be adjusted by raising the optional adjustable skirt bar in 6" increments to conceal the lower portion of the viewing surface. Complete DressUp Kit includes 46" skirt, 12" valance, and two 32" side drapes, with valance and drapery mounting bars. Hardware attaches without tools to the fittings found on all Cinefold frames. Specifically designed for use with the Cinefold and Cinefold DressUp Kit. Extends the theatre-like appearance of Cinefold draperies to the right and left of the screen to any desired distance, in IO' increments. Sets up in minutes, creates a professional-looking stage anywhere. Completely freestanding, infinitely adjustable to any height or width. Patented Slip-Lok release allows infinite height adjustment between minimum and maximum levels. Sturdy, inconspicuous flat steel bases. Four fire-retardant drapery fabrics available: Traditional 20 oz. cotton velour, 90% opaque; Vellite, 12 oz. brushed polyester, with a wrinkle-resistant, crushed finish; PolyKnit, 10 oz. satiny polyester; and Classic Twill, 12 oz. wrinkle-resistant polyester. Velour, Vellite, and PolyKnit are available in navy blue and black. Classic Twill is offered in 24 colors, including black and navy blue. Drape panels hemmed top and bottom to accept horizontal drape supports.